Chicken shawarma is usually cooked on a spit, but this is roasted in the oven. Here, I’ve served it modestly, on a pile of shredded iceberg, with some warmed pitta, lemon wedges and a tahini sauce. When I make this for groups of friends, or for a family lunch or supper, I slice up some fresh tomatoes sprinkled with mint, and cut some cucumbers into wedged slices, and macerate some red onions, cut into half-moons, with red wine vinegar or lime – in which case it will serve up to 10 people. Take a large resealable freezer bag and put the chicken thighs in it. Using a fine grater, preferably a microplane, grate in the lemon zest. Squeeze the lemons and add the juice. Pour in the olive oil and add the garlic, then add all the remaining ingredients. When you’re ready to cook, preheat the oven to 220C/200C Fan/Gas 7. Remove the chicken from the fridge and allow it to reach room temperature. 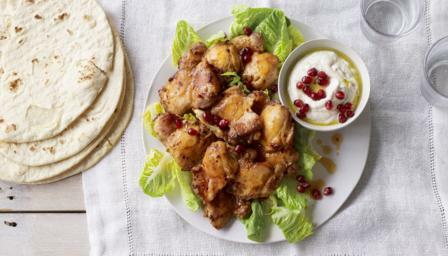 Tip the contents of the freezer bag into a shallow roasting tin – mine measures 44x34x1.5cm/17x13x½in – and make sure all the chicken thighs are lying flat and not on top of one another (if possible) before roasting in the hot oven for 30 minutes, by which time they should be cooked through (though obviously you must check) and golden on top. When the chicken’s more or less cooked, make the sauce simply by combining the yoghurt with the tahini and garlic, stir and salt to taste, and sprinkle with a few pomegranate seeds. Line a platter or a couple of plates with crisp lettuce, shredded or torn into pieces, and then top with the piping hot chicken, pouring the oily juices over them, unless you are, for some inexplicable reason, anti-oily-juices. If you wanted to make the chicken go further, you could cut the thighs into chunky slices rather than leaving them whole. And please do add any of the suggested accompaniments, itemized in my introduction.